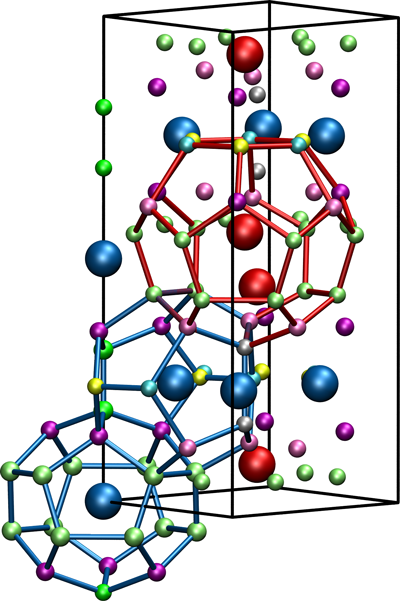 Crystal structure of the C14 Laves-phase of Fe2Nb with Fe atoms in red and Nb atoms in blue. The small spheres indicate possible tetrahedral sites for C and N interstitial atoms. Nb-alloying of steels can lead to the formation of topologically close-packed (TCP) phases, particularly Fe2Nb Laves and Fe7Nb6μ phases. The stability of these TCP phases is strongly affected by the presence of light elements like C and N. We calculate the solution energy of C and N in C14-Fe2Nb using density functional theory. N shows a strong preference to dissolve in larger interstitial voids while C shows a strong tendency to bind with a neighbouring Nb atom. The computed solution energies suggest N incorporation into Fe2Nb Laves phases while C is hardly soluble. The N-N interaction in Fe2Nb is strongly attractive and twice as strong as that of C-C. A comparison to C interstitials in the μ-Fe7Nb6 phase shows similar dependence of the solution energy on the atomic environment. In order to aid future work, we additionally provide the coordinates of interstitial sites in all TCP phases (A15, Zr4Al3, C14, C15, C36, χ, μ, σ, M, P, δ and R.) in the supplementary material.